The proton plays key role in the acid-base functions. In aqueous medium it is usually represented as H₃O⁺. A naked hydrogen ion has a vanishingly small size ( radius ~10⁻¹³ cm =10⁻¹⁵ Å) and therefore has a very high (charge/radius) ratio(~105 and is expected to be the most effective in polarizing other ions or molecules according to Fajan’s rules. In HO₃⁺ there are assumed to coordinate bonds from water oxygen to the proton, thus giving the proton a helium electronic configuration. Of these hydrates the most remarkable is the mono hydrate, melting at the much higher temperature then the covalent anhydrous acid. It is very stable and can be heated to around 100⁰C without decomposition. The mono-hydrate is about ten times viscous as the anhydrous acid. It has the same crystal lattice as the ionic ammonium perchlorate, showing that it is a ionic compound, [H₃O⁺][ClO₄]. We know that water dissociates weakly to H⁺ and OH⁻ ions. Regardless of what other ions are present in water, there will always be equilibrium between H⁺ and OH⁻ ions. The above relation tells us that in aqueous solution the concentration of H⁺ and OH⁻ are inversely proportional to each other. If H⁺ concentration increases 100 fold, that of OH⁻ has to decrease 100 fold to maintain Kw constant. 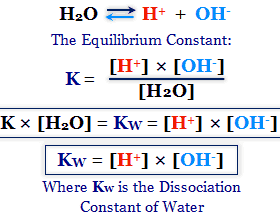 Dissociation of water into H+ and OH- ions are an endothermic reaction. The Reactions in which heat is absorbed by the system from the surroundings are known as endothermic reactions. If a system is in equilibrium, a change in any factors that determine the condition of equilibrium will cause the equilibrium to shift in such way as to minimize the effect of this change. Thus according to Le-Chatelier’s principle, increasing temperature will facilitate dissociation, thus giving higher values of Kw. The value of Kw at 200C, 250C and 600C are 0.68×10-14, 1.00×10-14 and 9.55×10-14 respectively. Thus for a solution having H⁺ concentration 10⁻¹ M has a pH = 1. And for a solution having H⁺ concentration 10⁻¹⁴ M has a pH = 14. For such solutions having H⁺ concentration in the range of 10⁻¹ M to 10⁻¹⁴ M is more convenient and meaningful to express the acidity in terms of pH rather then H⁺ concentrations. The use of small fractions or negative exponents can thus be avoided. For a mono basic acid molarity and normality are the same while they are different for poly-basic acid. pH = -log[H+] = -log(0.2) = 0.699. It follows from these relations that the lower the pH, the more acidic the solution is. If the acidity of a solution goes down 100 fold its pH goes up by the two units.For example a solution of pH 1 has [H+] which is 100 times greater than that of pH 3. Since HCl is strong electrolyte and completely dissociated. pH of a solution is 4.5. Calculate the concentration of H+ ion. If the acidity of a solution goes down 100 fold its pH goes up by two units. A solution of pH 1 has [H⁺] which is 100 times greater than that of pH 3. Taking the case of OH⁻ ions, the pOH will go down by two unit(from 13 to 11). The product of [H⁺] and [OH⁻] is 10⁻¹⁴ and that this has to remain constant. pH = -log[H+] and pOH = -log [OH-]. Calculate the [H+], [OH-] and pH of a solution prepared by diluting 20 ml of 0.1M HCl to one lit. We can now proceed to differentiate between neutral, acidic or basic on the basis of relative concentrations of H⁺ and OH⁻ ions on the one hand, and on the basis of pH on the other. A neutral solution is one in which the concentrations of H+ and OH- ions are equal. Mathematical definition of pH provides a negative value when [H⁺] exceeds 1 M. However pH measurements of such concentrated solutions are avoided as these solutions are not likely to be dissociated fully. Concentration of such strongly acid solutions is best expressed in terms of molarity than in terms of pH. Calculate the [H+], [OH-] and pH of a solution obtained by dissolving 28 gm KOH to make 200 ml of a solution.